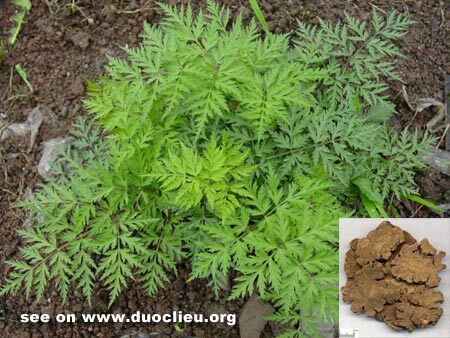 Chuanxiong rhizome (Chuanxiong)-Ligusticum chuanxiong Hort. Part Used & Method for Pharmaceutical Preparations: The rhizomes are dug in late May. The fibrous roots are soaked and cut into slices. Functions: 1. To invigorate blood and promote qi circulation; 2. To expel wind and stop pain. 2. Headache: a) wind-cold headacheChuanxiong rhizome (Chuanxiong) is used with Dahurian angelica root (Baizhi) and Asarum herb (Xixin) in the formula Chuanxiong Cha Tiao San; b) wind-heat headacheChuanxiong rhizome (Chuanxiong) is used with Chrysanthemum flower (Juhua), Gypsum (Shigao) and White-stiff silkworm (Baijiangcan) in the formula Chuanxiong San; c) wind-damp headacheChuanxiong rhizome (Chuanxiong) is used with Notopterygium root (Qianghuo), Ligusticum root (Gaoben) and Ledebouriella (Fangfeng) in the formula Qianghuo Shengshi Tang; d) headache due to blood stagnationChuanxiong rhizome (Chuanxiong) is used with Red peony (Chishao), Red sage root (Danshen) and Safflower (Honghua); e) headache due to deficient bloodChuanxiong rhizome (Chuanxiong) is used with Chinese angelica root (Danggui) and White peony root (Baishao).